Sue Hepworth : Guess what? Guess what? It's snowy here today. I could give you a photo, but it's April and I don't want to reward the weather. It's getting ridiculous. I went to see a film on Friday and enjoyed it so much I could have sat through it again straight away. The film was I Got Life (originally called Fifty Springtimes). This is the logline: 'A woman, separated from her husband, loses her job and discovers she's going to be a grandmother. Refusing to be pushed to the outskirts of society, she puts her foot down and decides to start over.' It was charming and funny and touching and uplifting and I loved it. When I got home I looked up the reviews online and guess what? That snooty man in the Guardian, Peter Bradshaw, had given it a measly 2 stars. This was the same reviewer who gave 4 stars to the most execrable film I ever sat through - Greenberg. I could see I Got Life had flaws from a male, hardass reviewer's point of view, but 2 stars? Sally Howe of Plotting for Beginners and Plotting for Grown-ups would have given it 5. I would give it 4. The film that Bradshaw liked that I hated was about a man of probably the same age as Bradshaw. 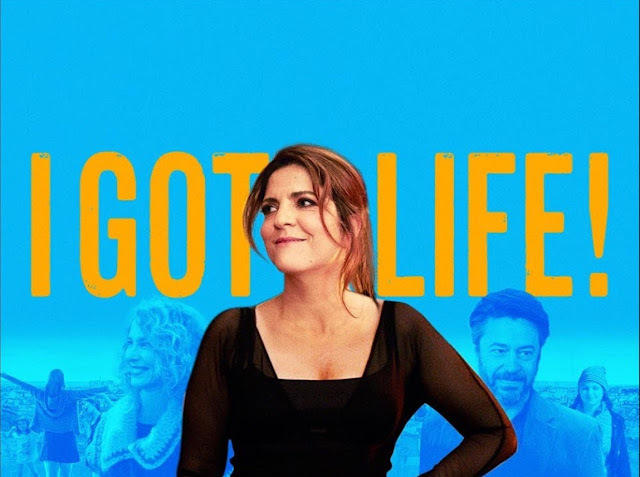 I Got Life was aimed at older women. Do you see what I'm getting at in all my chuntering about star ratings? Following your drift! I will keep a sharp lookout for for this movie, remind me a bit of a great favourite of mine called Bread and Tulips( pane e tulipani) set in Venice . A woman ( not middle aged, not young) is stranded in Venice and shapes a new life . I have no clear sense of what you might enjoy or not so caveat emptor : I watched Three Billboards outside Ebbing Missouri this weekend and loved it! It is funny and violent and heartbreakingly sad and funny again. I do feel fairly sure you might enjoy the dialogue. Thank you for the recommendation of Bread and Tulips, Marmee. I have made a note of it. I have had mixed reports on Three Billboards. My daughter said it was too violent for me, and my friend (who is fairly tough) said the only on-screen violence is someone getting beaten up who deserves it and I could shut my eyes for that bit. I am hoping it will be on the plane when I fly to Colorado in two weeks. This is where I catch up on a lot of films I have missed at the local cinema.